Good stuff shipped quick. Great price. Recommend LG to my friends. 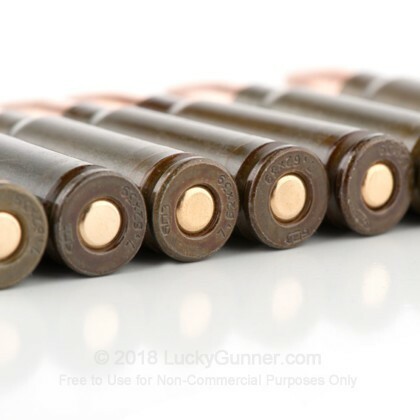 Good ammo for a good price. Always a pleasure to do business with LG. Recommend them to my friends and fellow shooters. I live in an area with a large coyote population. 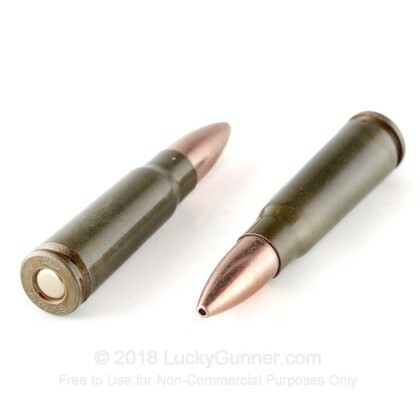 These are very good for the 100 to 150 yard range; accurate enough for the average sized visitor looking for a free meal. only took 3 days to ship to me, and this ammo shot and fed flawlessly in my SKS using a Tapco 20rd mag. Will definitely be ordering more. 90 rds 0 jams. Very impressed with both the ammo and Lucky Gunner. I fired about 300 of these rounds out of my WASR 10. All of them fired flawlessly. It is pretty dirty powder so expect to clean your AK for a while. 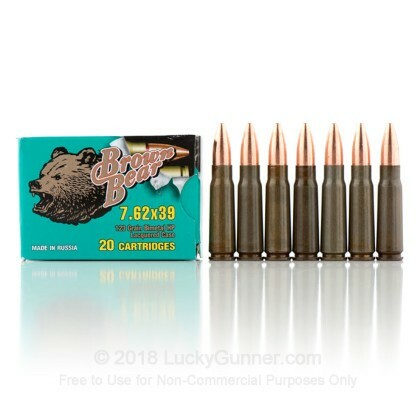 Awesome ammo at a great price! 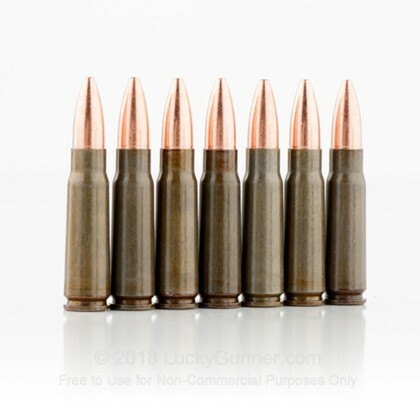 I bought this ammo for a Romanian AK47 to target shoot at a local range. I had no idea what to expect from Brown Bear, but I can say I shot all 500 rds in two days of shooting without a single misfire or miss feed. This ammo is superb. Order with confidence! I got 500 rounds of the hollow points and have shoot all 500 minus one 30 rd clip at the range. There were no misfires or jams with this ammo! 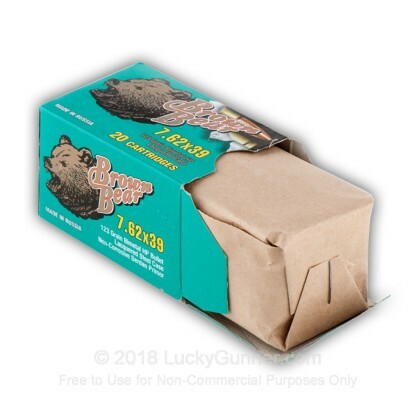 Quality ammo at an excellent price! good quality i woud like to buy but do not have enuf money! 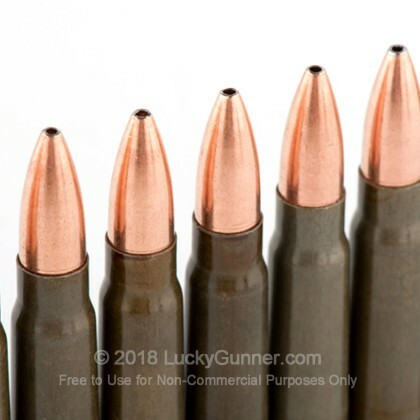 Q: What is armor piercing ammo. A: Armor piercing ammunition refers to a cartridge with a projectile that will pierce a target constructed of hardened steel. This type of round is typically steel rather than lead core. Q: Are the projectiles bi-metal? 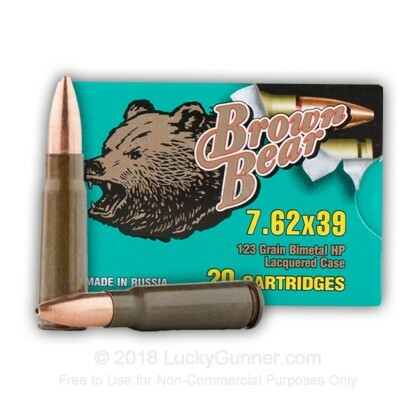 A: Hello Jake, This Brown Bear ammunition is loaded with bi-metal jacketed bullets. 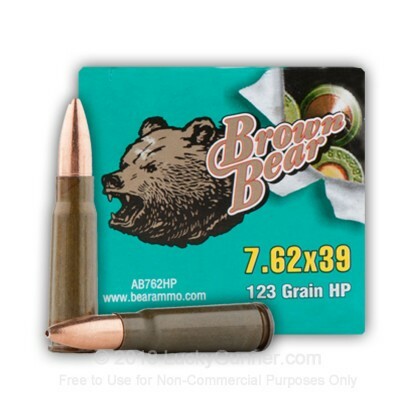 We also have this 7.62X39 - 123 Grain HP - Brown Bear - 20 Rounds ammo in stock in a smaller quantity.